The Thompson Trio was originally me (Karen) and my two daughters, Julie and Charlie. This web site was set up so my family and friends could keep tabs on us as we lived the ultimate adventure. On August 8, 2001 my little family and I moved to Jinzhou Liaoning China. The web site enabled mom (and whoever else wanted to) to watch her little darlings as they progressed through various stages and see our sometimes rather comical adventures. 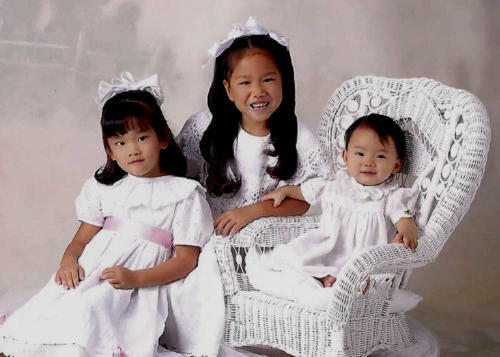 Well as many of you know while in China we felt the pull on our heartstrings to enlarge our family and on June 2, 2003 Krista Kelly Xia joined us and the trio became my three daughters. The website was and is also designed to aid those in the process of adopting from China. 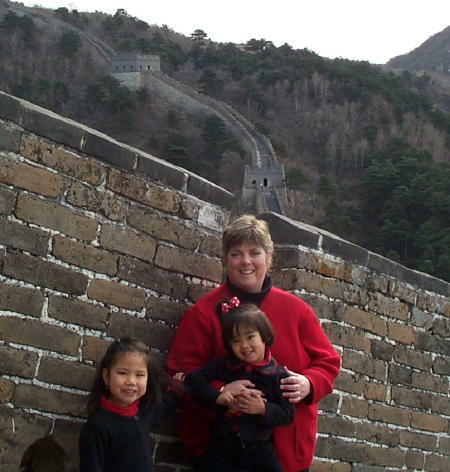 When I got Julie in the early years of Chinese adoption, I was soooooo hungry for information and personal stories of others who had already adopted I felt compelled to share our stories. While in China my sister and I decided to attempt a little cottage business of our own and we imported silk kites. You will find a link to sales page at the bottom of this page or you can click HERE. We have many beautiful kites, some designed especially for us. We have kites not found at the shops in Guangzhou where many adoptive families shop. Our kites are all very affordable and the prices are so low you can actually afford to fly them, although they are absolutely breathtaking gracing your walls. The New and Improved Thompsontrio! The Journey for Julie This is Julie's adoption story. Charlie's Adoption Adventure This is Charlie's adoption story. Our Return to China This is the opening page to our adventures in China. Christmas 2001 This page is primarily for my family so they will be able to share our Christmas. It contains photos of my daughters opening presents on Christmas morning. The Pearls Here you can find the finest quality fresh water pearls at the best prices!